NETWORK FINALS: On ABC, GREY’S ANATOMY gained 0.1 in final numbers at the expense of NOTORIOUS, which fell to an even more dismal 1.1. Both SUPERSTORE and THE GOOD PLACE rose 0.1 for NBC. CBS’s THURSDAY NIGHT FOOTBALL adjusted up to 6.1, 0.7 higher than last week’s game. 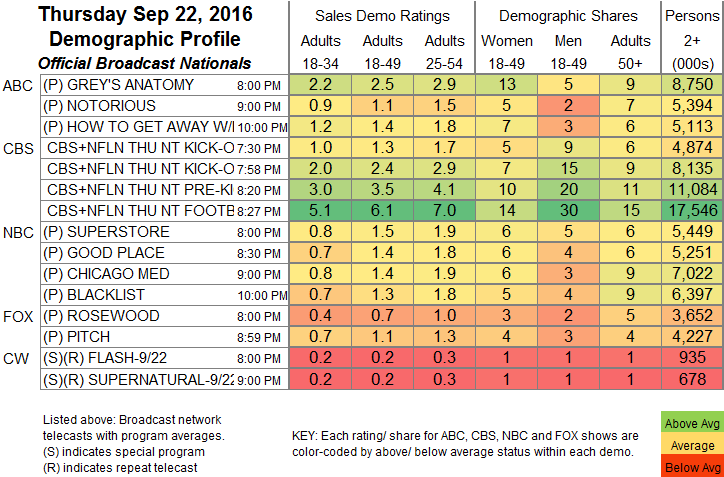 Both of CW’s reruns fell 0.1. One additional note: NOTORIOUS and PITCH had different trajectories in their premiere hours, as NOTORIOUS fell from 1.3 to 1.0, while PITCH climbed from 1.0 to 1.2. CABLE HIGHLIGHTS: THURSDAY NIGHT FOOTBALL (and its associated programming) crowded the top of Thursday cable, with the game itself at 1.47 on NFL Network, up 0.01 from last week. ESPN’s COLLEGE FOOTBALL game was at 0.62, down 0.09 from last week. On A&E, 60 DAYS IN gained 0.03 to 0.57, and BEHIND BARS was down 0.02 to 0.32. HGTV’s FLIP OR FLOP lost 0.07 to 0.46, HOUSE HUNTERS INTL was down 0.03 to 0.31, and HOUSE HUNTERS dropped 0.06 to 0.30. Lifetime’s PROJECT RUNWAY added 0.04 to 0.44. Nickelodeon’s afternoon LOUD HOUSE again made it to the Top 10, up a tick from last Thursday to 0.38. On Tru, IMPRACTICAL JOKERS fell 0.04 to 0.34, and INSIDE JOKES was down 0.06 to 0.22. 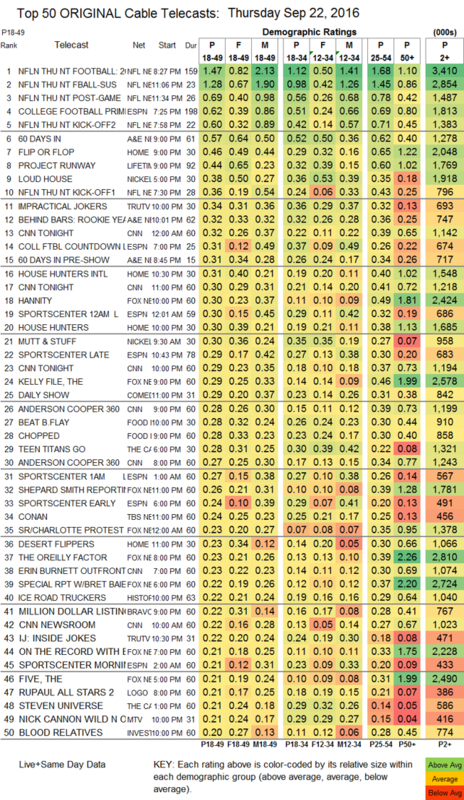 On Food Network, BEAT BOBBY FLAY and CHOPPED were both at 0.28, the latter up 0.02 from last week. History’s ICE ROAD TRUCKERS dropped 0.08 to 0.22. Bravo’s MILLION DOLLAR LISTING returned at 0.22. RUPAUL’S ALL STAR DRAG RACE jumped 0.09 to 0.21 on Logo (it didn’t simulcast on VH1, which may explain the increase), and FINDING PRINCE CHARMING was up 0.02 to 0.09. On MTV, WILD N OUT lost 0.03 to 0.21, and JOKING OFF ticked down to 0.13. FX’s now-renewed BETTER THINGS fell 0.05 to 0.16. On We, JIM & CHRISSY dropped 0.03 to 0.15, and CUTTING IT IN THE ATL stayed at 0.12. POP’s IMPACT WRESTLING held at 0.09.